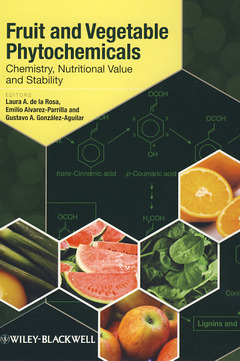 Fruit & vegetable phytochemicals: chemistry, nutritional value & stability DE LA ROSA CARRILLO Laura, ALVAREZ-PARRILLA Emilio, GONZALEZ-AGUILAR Gustavo A.
Auteurs : DE LA ROSA CARRILLO Laura, ALVAREZ-PARRILLA Emilio, GONZALEZ-AGUILAR Gustavo A. There has been increasing interest in the nutritional properties of fruits and vegetables as sources of health-promoting phytochemical compounds. Epidemiological data correlate a high consumption of these compounds with a lower risk of several cardiovascular and degenerative diseases. Phytochemicals are a heterogeneous group of chemical compounds with numerous biological actions. Fruit and Vegetable Phytochemicals: Chemistry, Nutritional Value and Stability provides scientists in the areas of food technology and nutrition with accessible and up-to-date information about the chemical nature, classification and analysis of the main phytochemicals present in fruits and vegetables - polyphenols and carotenoids. Special care is taken to analyze the health benefits of these compounds, their interaction with fiber, antioxidant and other biological activities, as well as the degradation processes that occur after harvest and minimal processing. The book commences with a review of the beneficial effects of whole fruits and vegetables. The following chapters describe chemical and biochemical aspects of different phytochemical groups commonly found in fruits and vegetables, including polyphenols, flavonoids, carotenoids and dietary fiber. Coverage also includes the analytical aspects of phytochemicals extraction and determination of antioxidant capacity. Fruit and Vegetable Phytochemicals concludes with chapters focusing on the effects of harvest and minimal processing technologies on the degradation of phytochemicals. 1. Phenolic Compounds: Chemistry and Occurrence in Fruits and Vegetables. Francisco Tomas Barberan, Research Group on Quality, Safety and Bioactivity of Plant Foods, Department of Food Science and Technology, CEBAS (CSIC), Campus University Espinardo, Murcia, Spain. 2. Synthesis and Metabolism of Phenolic Compounds in Fruits and Vegetables. Mikal Saltveit, Department of Plant Sciences, University of California, Davis, CA, USA. 3. Phenolic Acids and Derivatives of Hydroxycinnamic Acid. Ronald B. Pegg, Department of Food Science & Technology, University of Georgia, Athens, GA, USA. Rong Tsao, Specialty Bioproducts and Bioprocesses, Food Research Program, Agriculture and Agri-Food Canada, Guelph, Ontario, Canada. Bimanagouda S. Patil, Department of Horticultural Sciences, Texas A&M University, College Station, TX, USA. Pilar Cano, Department of Plant Foods Science and Technology, Instituto del Frío-CSIC, Madrid, España. G. Mazza, Pacific Agri-Food Research Centre, Agriculture and Agri-Food Canada, Summerland, BC, Canada. Patricia A. Murphy, Department of Food Science and Human Nutrition, Iowa State University, Ames, IA, USA. 9. Methods of Analysis of Antioxidant Capacity of Phytochemicals. Shela Gorinstein, Department of Medicinal Chemistry and Natural Products, The Hebrew University-Hadassah Medical School, Jerusalem, Israel. Olga Martin Belloso, Department of Food Technology, Universitat de Lleida, Lleida, Spain. 10. Chemistry and Biological Actions of Glucosinolates and Other Sulfur-containing Phytochemicals. Roderick H. Dashwood, Linus Pauling Institute, Oregon State University, Corvallis, OR, USA. 11. Chemistry and Biological Actions of Carotenoids, Lutein and Lycopene. Maria de Jesus Periago, Department of Food Science and Nutrition, Faculty of Veterinary, University of Murcia, Espinardo, Murcia, Spain. Rui Hai Liu, Department of Food Science, Cornell University, Ithaca, NY, USA. 13. Fiber: Total, Soluble and Insoluble. Fulgencio Saura Calixto, Department of Nutrition and Metabolism, Instituto del Frío-CSIC, Madrid, España. 14. Enzymatic and Non-enzymatic Degradation of Polyphenols. F.García Carmona, Department of Biochemistry and Biology-A, Faculty of Biology, University of Murcia, Espinardo, Murcia, Spain. 15. Degradation of Phytochemicals by Microbiological Attack. Arvind Bhagwat, Produce Quality and Safety Laboratory, U.S. Department of Agriculture/ Agricultural Research Services, Beltsville, MD, USA. Saúl Ruiz-Cruz, Laboratorio de Fisicoquímica , Centro de Investigación en Alimentación y Desarrollo, Unidad Delicias , Delicias, Chihuahua, Mexico. 16. Degradation of Phytochemicals and its Prevention in Fruits and Vegetables.